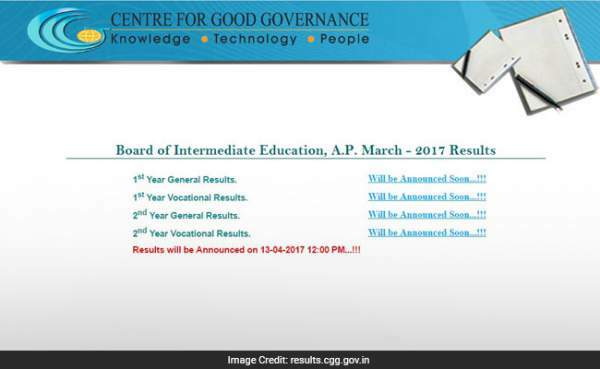 AP Inter 1st Year Results 2017: Andhra Pradesh Intermediate first year result for Junior general and vocational courses’ examination held in the month of March 2017 will be declared at 12 pm today. The BIEAP Inter result 2017 will be published online on the official websites like results.cgg.gov.in, bieap.gov.in, manabadi, and schools9. The official update suggested that the Human Resource Development Minister Ganta Srinivasa Rao is going to release the results at a press release event scheduled for April 13, 2017, at 12 noon. Andhra Pradesh intermediate 1st year exam held from March 1 to 17, 2017 at various examination centers across the state. Since then, the candidates have been waiting eagerly for the result to be declared as their future depends on it. Candidates from groups like MPC, BiPC, MEC, CEC, HEC, and others will be able to check the same at BIEAP website. Moreover, the AP intermediate junior results 2017 name wise, branch wise, roll number wise, college wise, and district wise, all will be published online on official sites soon. Check Online: AP Inter 1st & 2nd Year Result 2017. As many as 2,23,099 candidates appeared for the said exam this year. Last year, the results of 1st year general were announced on April 19, 2016, by BIEAP. This time, the same has been announced on April 13. The students should know how to check the AP intermediate result 2017 online by entering their roll number, date of birth, and other details. The candidates need to send an SMS in the following manner.